Keep it close: Plant your garden where you’ll walk by it daily so that you remember to care for it. Also, a vegetable garden is a place people like to gather, so keep it close to a pathway. Make it easy to access: If you need to bring in soil, compost, mulch, or wood by truck or car, make sure your garden can be easily reached by a vehicle. Have a water source close by: Hauling hose around to water the garden will cause extra work and frustration. Keep it flat. You can garden on a slight slope, and, in fact, a south-facing one is ideal since it warms up faster in spring. However, too severe a slope could lead to erosion problems. If you’re a first-time gardener, 100 square feet is plenty of garden to take care of; start small and build on your success. However, if you want to produce food for storing and sharing, a 20-foot-x-30-foot plot (600 square feet total) is a great size. Fruiting vegetables, such as tomatoes, peppers, beans, squash, melons, cucumbers, and eggplant, need at least 6 hours of direct sun a day for good yields. The amount of sun doesn’t have to be continuous though. You can have 3 hours in the morning with some shade midday and then 3 more hours in the late afternoon. Greens, such as lettuce, arugula, bok choy, and spinach, produce reasonably well in a partially shaded location where the sun shines directly on the plants for 3 to 4 hours a day. Root crops, such as carrots, potatoes, and beets, need more light than leafy vegetables, but they may do well getting only 4 to 6 hours of sun a day. A site that’s sunny in midsummer may later be shaded by trees, buildings, and the longer shadows of late fall and early spring. If you live in a mild-winter climate, such as parts of the southeastern and southwestern United States where it’s possible to grow vegetables nearly year-round, choose a spot that’s sunny in winter as well as in summer. You can have multiple vegetable garden plots around your yard matching the conditions with the vegetables you’re growing. If your only sunny spot is a strip of ground along the front of the house, plant a row of peppers and tomatoes. 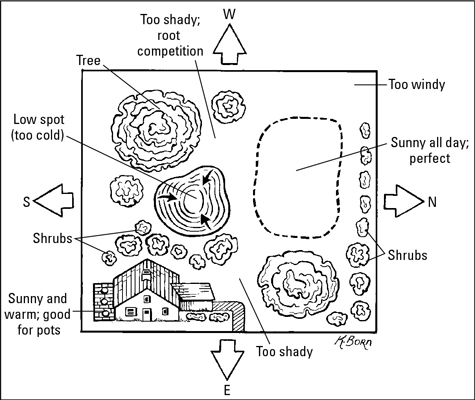 If you have a perfect location near a backdoor, but it only gets morning sun, plant lettuce and greens in that plot.